This book addresses the political aspects of fifth-century Athenian tragedies, setting them in their immediate historical context. It is an important topic and one that only rarely and sporadically finds its way into accessible accounts of Greek tragedy. Carter sets out to elucidate to a student and general audience how and why Athenian tragedy should be read as a political art form. The political content of ancient drama has been the subject of much scholarly debate in the last thirty years, but much of that debate is highly technical and inaccessible. Carter demonstrates that like the contemporary satirical comedy of Aristophanes, or indeed the sculptures of the Parthenon, tragedy involved a highly political dimension.He provides stimulating and provocative analyses, from varied points of view, of the political aspect in several individual tragedies (always referred to in modern translations). To this he adds a chapter on the ‘reception’ of political tragedy, alluding to theatre and film productions of the Greek plays that have taken an overtly political stance within a modern context. It is a real strength of the book that he illustrates by discussion of particular approaches, including his own, work in action. He puts theory into practice. This will prove very helpful to sixth formers and undergraduates alike. Overall the standard of accuracy is high, and the range of reading evinced is impressive. The book is highly recommended to schools and universities alike. Carter succeeds admirably. He makes a topic that is difficult and potentially confusing for the non-specialist, comprehensible and highly readable. 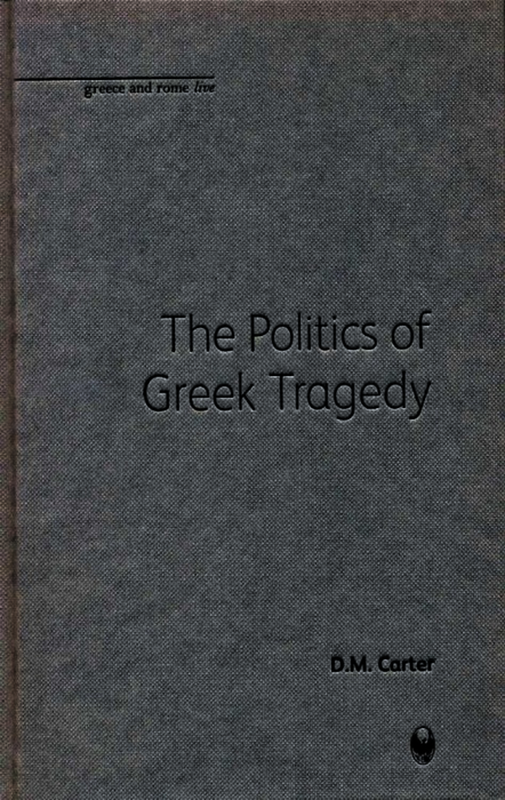 The book combines some very basic introductory material with some fairly sophisticated arguments about Greek tragedy. While its primary audience is students, there is something here for specialists as well. Carter’s book is admirable for the clear was it introduces this topic to the general reader [...] as an introductory survey book for the general reader, it is an unqualified success. A well-written contribution to the discussion on the nature of this much-studied genre, directed at students and the general reader as well as specialists. The first part addresses primarily the student while the main chapters engage in scholarly audience as well. 'The Politics of Greek Tragedy' takes an important step forward in the debate on the nature of Greek tragedy. What is really good is Carter’s suggestion that we are dealing with a theatre of the establishment, that it is not particular democratic and that “behind the dramatic events there are strong political values. D.M. Carter is Lecturer in Greek at the University of Reading.